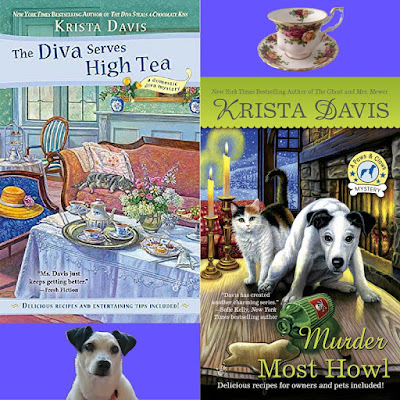 Mystery Lovers' Kitchen: Devils and Dragons-Oh My! No, I'm not switching to science fiction. This is just how my life has been lately so I thought I'd share. and emerge as one of the largest moths we have. But before you rush to your closet to protect your clothes, get this-he will have no mouth! They gorge while they're turquoise, but once they're moths, they only live a month. They can't eat, they lay eggs like crazy, and die of exhaustion. And you guys think writers make up absurd things. What kind of horribly cruel fate is that? Some great pictures at Dave's Garden for those who might be interested. Lest you think I'm exaggerating about devils, though, I also encountered this guy. To be honest, I didn't get close to him like I did the Hickory Horned Devil. I stood on the road, debating whether he was a branch that had fallen. In the end I decided that the pattern on his back was far too regular. I took a photo, certain I would laugh at my unreasonable fear when I enlarged it. Out of an abundance of caution, we turned back. Hmm. Looks like fear can be a good thing. 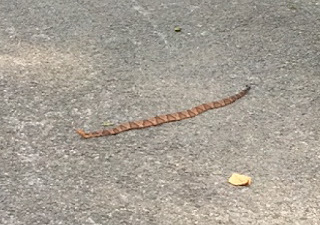 Definitely a copperhead. I wouldn't mind if he didn't have a mouth. By now you're probably hoping that I didn't meet a dragon on the road. Nope, they're in my garden. Now to be honest, I'm not much of a gardener. My theory is that I planted them and now they should grown so I can eat or admire them. Not all plants agree with me. 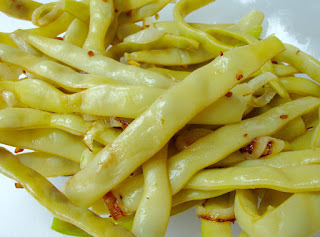 But these wax beans known as Dragon's Tongue think my approach is just fine. I think Sheila may have blogged about them last year. You'll find them at the farmer's market with their distinctive purple markings on a creamy background. A Dutch hybrid, they're apparently very popular with kids. Who could pass up dragons or the purple color? They can be eaten raw, which seems to be an overwhelming preference because the purple looks so cool in salads. I did try one (for you, of course). They're surprisingly juicy, a feature that prevents them from being in grocery stores. Apparently they don't hold up well for mass processing. Recipes are almost nonexistent. 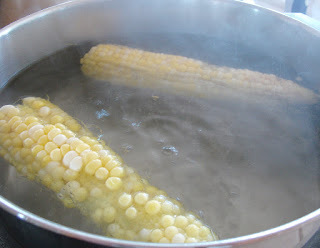 So I took the advice of one site and simply dumped them into boiling water. After about 7 minutes, they were perfect. I sauteed some onion and garlic and mixed it with them. By the way, if you're a city type but you'd like to try them, they grow well in pots. So where's the recipe you ask. This week I found turkey tenderloins at the store. So I checked around to see how to cook them. One recipe said eight minutes in a pan! Hmm. Another recipe took some serious hits from people in the comments. The idea was to roast them in the oven. So I did it my way. Just as an aside, I don't think it's beneficial to sear turkey or chicken when it's skinless. All you end up with is a tough exterior. So I did my favorite quick roast that I've been making with a huge zucchini from the garden (another plant that likes my theory that I plant and they grow). The meat turned out great. I love cooking zucchini at the same time. 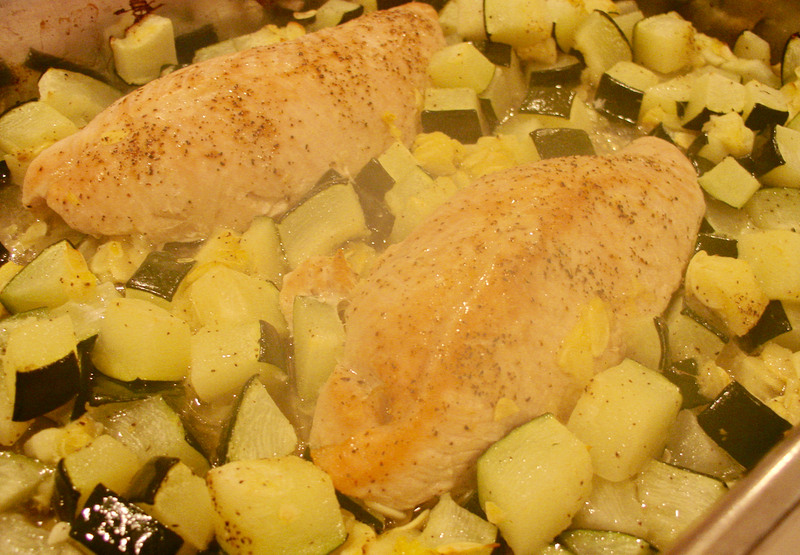 The juices from the turkey and the zucchini mingle. It's not thick like a gravy, of course, but it's delicious. Now this isn't Thanksgiving turkey or company fare. 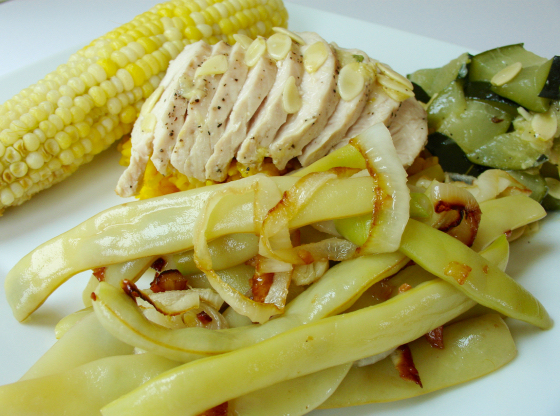 And if it seems bland to you, then by all means dress it up with your favorite seasonings. Penzey's Northwoods Seasoning would probably be great! Be sure to salt and pepper the meat and the zucchini. One more observation about my abysmal gardening skills. I planted corn. (hysterical laughter here) I did not expect it to grow. But it did! We have determined that it is the-best-corn-ever. So don't be deterred if you're not much of a gardener. The corn made it all worth it. It didn't look perfect but it tasted fabulous! Preheat oven to 400. Cut the zucchini into thick (3/4 inch) slices and cut each slice into chunks. Place in a large roasting pan. Sprinkle with salt and pepper. Drizzle with sunflower oil. Turn with a large spoon to coat. Salt and pepper the turkey. Shove the zucchini aside to make room for the turkey. Pop a few pieces of zucchini between the tenderloins to separate them. Drizzle the tenderloins with just a bit of oil. Roast 20 minutes. Remove from oven and turn the zucchini a bit. Roast another 10 minutes and check the internal temperature of the meat. Shoot for 160-165. Remove and let turkey sit about 10 minutes before slicing. Drizzle pan juices over the meat to serve. Dragon's tongue turns cream-colored when cooked. Oh no! Think of the little turquoise devil. He was really very sweet. Just occurred to me that it's big flying grasshopper season here. They fascinate my dogs. There one minute but not the next. Maybe that's what Sparky saw? Glad you left the snake alone! Me too, Libby! I stopped a good distance away and thought I was being silly. Guess not! I think we share the same gardening theory although in my case it's more like I plant it, you die! That's the problem, Peg. Too many plants subscribe to the dying theory. We had a lot of rain this summer, so maybe that accounts for the lucky growing season this year. Never a dull moment, Krista! All veggies hate us. Too bad we can't eat more flowers. I love the sound of the turkey! Will try soon. Thanks. The turkey isn't fancy, but we love it! And it's the best way I've found to use up the zucchinis that I don't notice until they're the size of an arm! I wish I had a picture of the creature that tried to get in our kitchen window yesterday -- a black bear! I have to say that I think it's amazing how many people manage to snap a photo when they're in a panic. You must have been cooking something that smelled delicious, Celia! You do have the critters this year! Our urban neighborhood is teeming with lizards; love those little boogers. We have city possums and squirrels. Unfortunately snakes. They incite me to do a little dance in place when I run into one. Lots of bugs and butterflies. 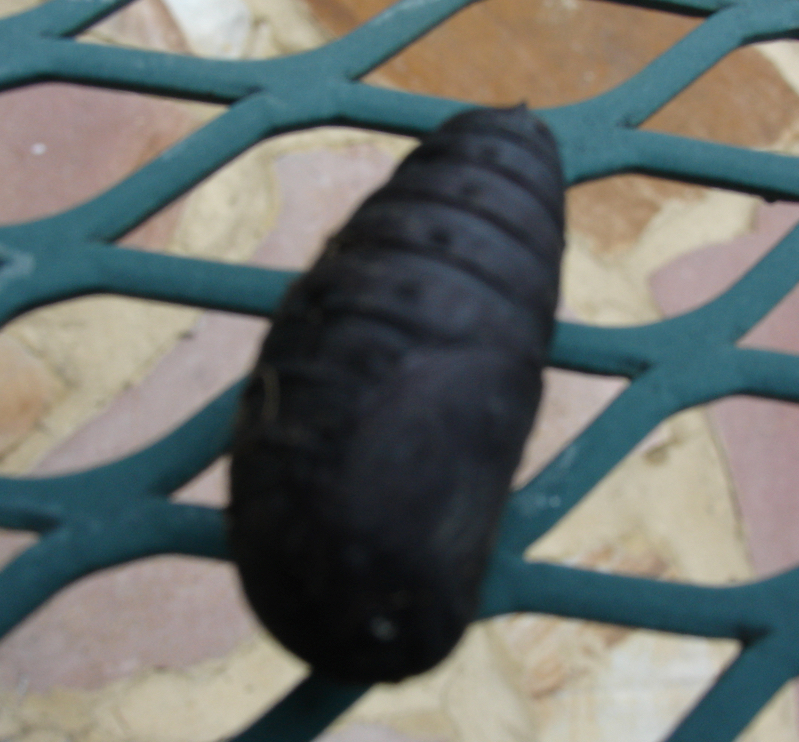 I was watching a chrysalis on a fence post a couple of weeks ago. It was bright green, then almost black. It started hatching but its occupant unfortunately died before it made it out. I so wanted to see what it would be. Probably a moth. I'm not a fan of snakes. Dancing in place is much better than what I usually do! What a shame that the occupant of the chrysalis didn't make it. Even if it was a moth, it would have been nice to see. I have to admit that I used to only come to this blog when there was a giveaway but now I find myself checking it almost daily to see what kind of stuff you guys can get me to try and cook today. haha!!! Thanks for the fun daily blog but even more so, for all of your amazing stories that have become my escape and the fun recipes those all hold as well! I appreciate every one of you! Aww, that made my day, Amanda. I'm so glad that you're now a regular. You never know what we might be up to here! Yeah hey Amanda! We're so glad you're coming back every day. 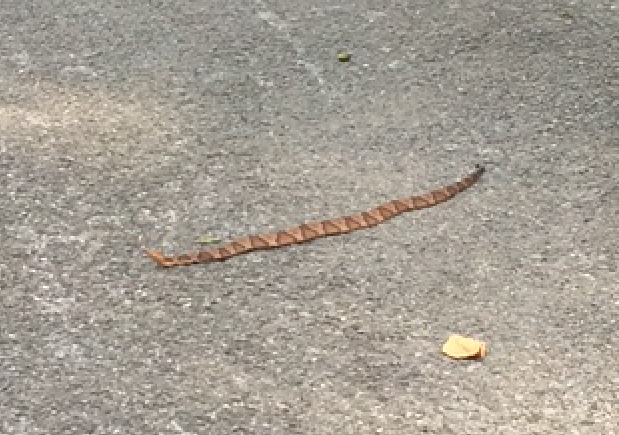 Krista, the copperhead would have sent me screaming. I don't mind little garden ribbon snakes but poisonous snakes oh no… my first husband and I grew corn one year – organic of course. We even sold some to the organic food market in Knoxville, but then learned the corn was field corn, made for cows not humans. We never showed our face in that shop again LOL . John and I are having a banner year for tomatoes and peppers and zucchini, after he nearly lost his mind battling the woodchucks. So this recipe will be perfect to try, leaving out the salt of course. LOL! That's such a funny story about the corn. How embarrassing! I wouldn't have gone back, either. Oops! Hmm, I wonder if the seed packets mention whether it's for human or bovine consumption? 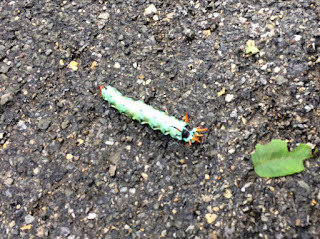 Krista, Charlie and I encounter strange creatures on our walks, too! There's a red/black bug that I'm researching - it looks like a cross between a spider and an ant - we're not getting too close! Thanks for the recipe, we're out of zucchini for the summer, and decided it's too late to plant more so I have to (gasp!!!) buy vegetables at the market, something I don't like to do during the summer because I like to grow my own! I know, it's hard to buy veggies when you could be buying them. Our zucchini is coming to a swift end. But our tomatoes are so late this year. They're still not ripe! I hope you can get a photo of the spider/ant. It sounds fascinating! We've had dragon tongue beans in previous years' CSA shares. This year the deer ate them ALL and most of the corn, too. Greedy! I do like cooking meat with veggies; it seems to make both more tender. I think you're right about the meat and vegetables! Beans and corn would be very attractive to deer. Our neighbors have trouble with them, but our dogs make them think twice about coming to our yard. Interesting. I think I'd prefer reading about devils and dragons instead of actually encountering them! I totally agree in the case of Mr. Copperhead. I hope I don't run into any of his family members. The turquoise devil was really quite interesting, though! Glad you enjoyed it, Elaine! We planted our first garden this year and all we have are green beans and if we are lucky some mini corn. I wonder if my kids would eat those beans. We might have to try them next year. 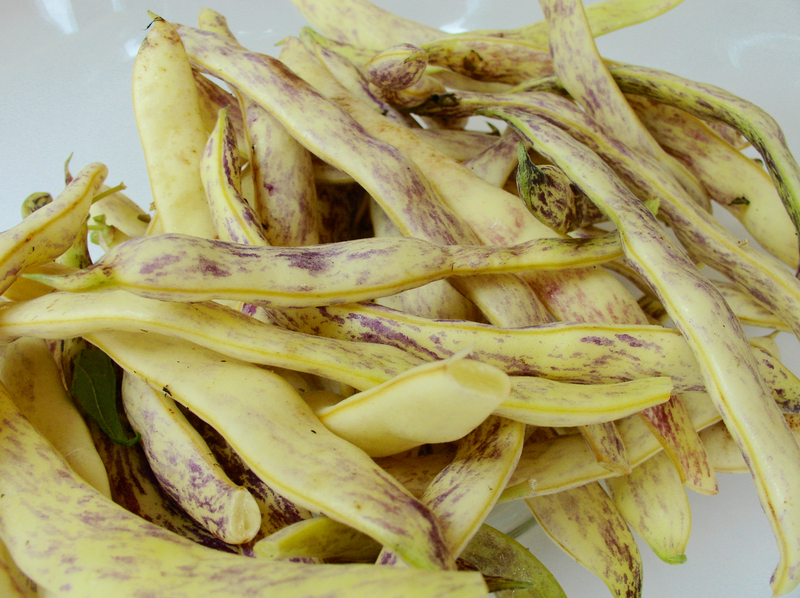 If they don't like the beans you planted, ask if they would like purple beans better. LOL! You never know with kids. I hope your corn is as delicious as ours is. I'm definitely planting corn again!